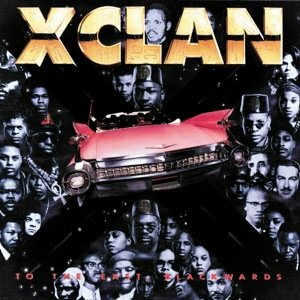 Today (24th April 2015) marks the 25th Anniversary of the release of X-Clan’s debut LP ‘To The East Blackwards’. Packed with novel sample material, Afrocentric sentiment, black nationalist rhetoric and mystic terminology, it was a memorable debut, the popularity of which the group never quite succeeded in repeating (although we have to say we are remain big fans of the group’s 1992 follow up ‘Xodus’ and group member Professor X’s solo outings ‘Years of the 9’ and ‘Puss ‘n Boots’). Historically best remembered for Professor X’s monologues “This is protected by the Red, the Black and the Green, with the key ...” which proliferated the album and subsequently those of group members and associates (see Isis and Queen Mother Rage), the album is still a solid listen front to back 25 years on. In the years after its release tragedy befell the group, DJ Sugar Shaft reportedly dying of complications of AIDS in 1995 and Professor X dying of meningitis in 2006. Of all the albums we’ve featured since writing these anniversary posts, this is the first not to be available in full on Youtube, although you can check the reasonable quality MTV rips of the videos for singles from the album, ‘Funkin’ Lesson’ and ‘Heed the Word of The Brother’. The album comes in at #13 in Ego Trip’s list of the Top 25 Rap Albums of 1990. ‘Heed the Word of the Brother’ appears on both our Classic Material 1990 Mixtape and our 1990 Rap Megamix.